Mozilla's Firefox browser is known for its speed and a large collection of extensions that let you customize the experience to your heart's desire. But when Firefox is running slow, crashing, or not loading websites properly, it can be frustrating to figure out why. Follow our step-by-step guide to get your Firefox back to tip-top condition. What are the most frequent problems with Firefox? Overall, Firefox is a top-rated and highly reliable browser — good choice for both professional and everyday users. However, serving so many platforms on so many devices and screens, even the best of the best sometimes let us down. 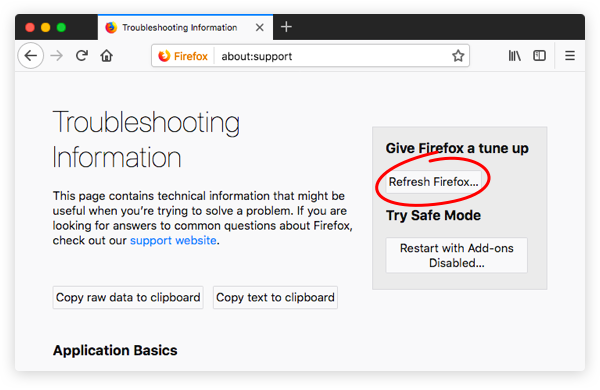 But worry not, in this how-to we've combined the most frequently occuring Firefox problems and written specific instructions on how to fix them. Slow browsing experience is truthfully beyond annoying. It seems like it's almost working, but you can't get anything done. Here we've listed some suggestions that should get your Firefox back to normal. See how many tabs you have opened. More than a few? Active tabs mean active processes that take up your laptop's RAM and drastically slow down its capabilities. Just close the tabs you're not actively using. If they are important to remember, save them to bookmarks or stash them in a special "Read Later" list in a to-do application such as 2Do. All the websites you visit leave behind cached image files, which are supposed to speed up load times, and cookies, which can save you from having to log in over and over. Those are big conveniences if they work the way they're supposed to, but sometimes cache and cookies can cause glitches and slowdowns. Alternatively, you can do this easier and safer with CleanMyMac. Just click Privacy in the sidebar and then choose Firefox from the list. Change the time range to Everything, and you can clear all of the cookies, browsing history, downloads history, tabs, saved passwords, and even autofill values. If closing tabs and clearing the cache didn't work, it's a good idea to update Firefox and macOS to its latest versions. When Firefox is active, just click on Firefox in the menu and select About Firefox. The latest available update should start downloading automatically. When it's ready, click Restart to Update Firefox and you are ready to go. Updating macOS is easy too. Just launch the App Store on your Mac. Go to the Updates tab and wait till it shows you all the new software versions available. If you see new updates for macOS, click Update and follow the restart instructions. If the problem persists, check for high hardware resource usage. For basic information, you can use Mac's native Activity Monitor. However, to see the whole picture, get a pro-level app, such as iStat Menus. If you see Firefox using too much memory or CPU, you need to take some action. It's very likely that one of your installed plugins is the culprit. To check for that, click the Menu button, and then choose Add-ons. In the Add-ons Manager's Plugins panel, you can select Never Activate for each plugin, then restart Firefox and see if the problem is still happening. If the problem is gone, turn the plugins back on one by one, just changing that Never Activate option back to Always Activate. Restart Firefox each time and then try to recreate the error. Once the problem reappears, you'll know it was likely caused by the last plugin you re-enabled. You can also remove a plugin with CleanMyMac's Extensions tab, which is actually a lot easier than using Firefox. In Firefox itself, you have to typeabout:plugins, then find the file path for that plugin and navigate to it in the Finder. Mozilla then recommends you change the filename to add an X in front, which will remove the plugin. You can reinstall a fresh copy of the plugin (from official sources only! ), or just see if you can live without it. To check your extensions in Firefox, go to about:add-ons, then click Extensions in the sidebar. You can disable extensions here, and then turn them back on one by one, in the same way you just checked your plugins. 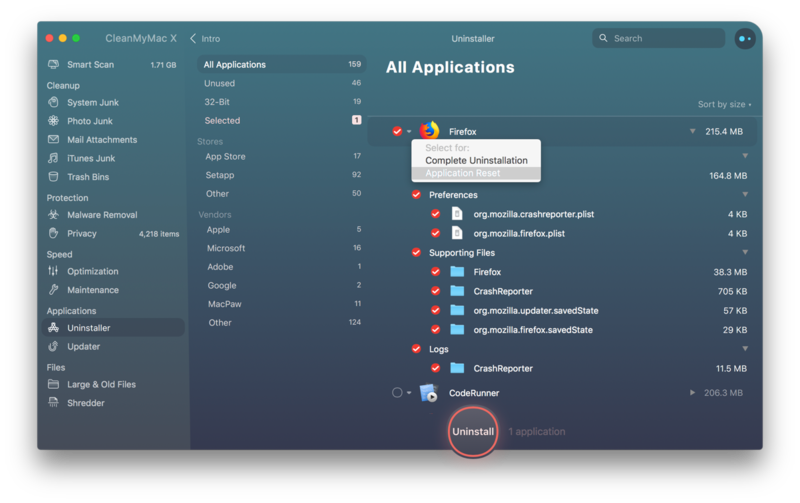 If you want to remove all your extensions and start fresh, you can click the Remove button or use the Extensions tab in CleanMyMac, which manages extensions, add-ons, and plugins from one place. Preventing Flash content from loading automatically deserves a separate explanation. Some websites use way too much Flash content, and loading and playing all of that uses up your computer's resources, especially if you keep a lot of tabs open. Luckily, you can tell Firefox to stop loading Flash content by default, until you ask for it. Click the Menu button and select Add-ons, or select Tools > Add-ons from your Mac's menu bar. (Or press Command-Shift-A, or type about:add-ons into the URL bar. It all takes you to the same place.) In the Add-ons Manager, click Plugins in the sidebar, and then look for Shockwave Flash. Change the dropdown from Always Activate to Ask to Activate. After that, websites will display an Activate Adobe Flash button in place of Flash content, and all you have to do is click that to allow Flash to display it. Following the tips above should eliminate 90% of your Firefox problems. But if you're still experiencing troubles, there is more you can do. Read on. Whether Firefox shows you an error message every time you try to launch the app or right when you're in the middle of a working session, there is only one way to fix that — reinstall the application. The easiest way to reinstall Firefox is to quit it, delete the Firefox file from your Applications folder, and download the new version from the official Mozilla website. That will uninstall the application but keep all your user data intact, and when you reinstall a new copy, you bookmarks and passwords will still be there. But that's not the best way to do it, since Firefox leaves all kinds of data on your hard drive besides the main application file. 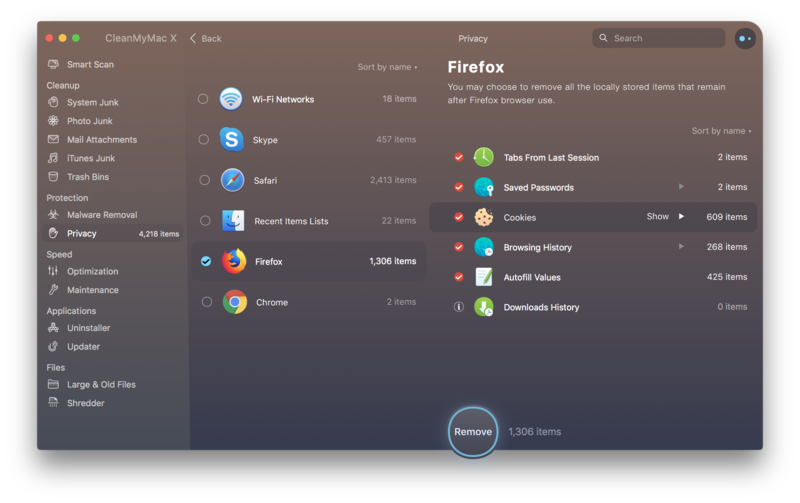 A better way is to use an application that's able to delete all Firefox information completely or simply reset the app, such as CleanMyMac. There are rare cases when the "Firefox quit unexpectedly" message could be caused by the Mac security update. This happens when your Mac's firewall used to recognize previous versions of Firefox but no longer trusts the new one. Follow official Mozilla documentation to fix this issue. So your Firefox is fast and doesn't randomly quit, but still doesn't seem to load websites. There are a few things that might cause this, so let's zero in on the problem by gradually excluding various perpetrators. Turn your modem off and on (helps in nearly all cases). Check that your network connection is performing up to standards by using WiFi analyzers, such as NetSpot and WiFi Explorer. As soon as you launch NetSpot, make sure it's set to Discover mode, and it will scan all nearby WiFi networks automatically. WiFi Explorer is just as easy — launch the app and click the play button to analyze the network quality around you. If your WiFi network seems to be fine, it's good to check whether the connection works in other browsers, like Safari or Chrome, just to make sure that the problem in fact is with Firefox specifically. Then, check the settings in your firewall by following the steps outlined by Mozilla. If upon loading the website you get the "Proxy server is refusing connections" message, there is an easy fix for that. In case Firefox shows you that it has troubles validating some website's security certificate, it might be related to improperly set date and time on your system. Just make sure your timezone settings in System Preferences > Data & Time are configured correctly and Firefox should go back to validating the website certificate normally. Another option you can try is flushing the DNS cache, which acts as a temporary database, storing all sorts of connectivity logs and website access attempts. Combine flushing the DNS cache with clearing out cache and cookies from Firefox, and restarting your Mac to get the best result. In the address bar, type about:config and press Return. The about:config "This might void your warranty!" warning page may appear. Click "I accept the risk!" to continue. Hold down the Ctrl key while you click on the list of preferences. Select New and then select Boolean. In the "Enter the preference name" field, enternetwork.dns.disablePrefetch and click OK. The last step to try to fix the website loading issue is to check your system for malware. If you remember Firefox being haunted by ad pop-ups, toolbars you didn't install yourself, or a new default home page, you might have picked up some malware that's hijacking your browser sessions. A simple malware tool for Setapp users is CleanMyMac Malware Removal tool. It's a free download, with a pro license for more active, real-time protection. The free product will however scan your Mac and safely remove any malware at no cost to you. When your Firefox is just generally behaving incorrectly, a few more tips might come in handy. Start with restarting your Mac, and then clear the cache and troubleshoot your plugins as described above. When clearing the cached data doesn't help, try restarting the browser in Safe Mode. This will temporarily turn off your extensions, as well as any extra themes and toolbars, and hardware acceleration. The easiest way to do this is to quit Firefox and restart it holding down your Mac's Option key. If the problem you were having magically goes away in Safe Mode, then you can proceed to check your extensions, themes, and anything else you've added to Firefox. If you're still having the problem in Safe Mode, that's a sign you might need to just trash your copy of Firefox and start over with a fresh install. There is another clever feature inside Firefox that clears out your extensions and themes, plus resets all the preferences to default, but keeps your personal information intact, including bookmarks, history, open tabs and windows, saved passwords, autofill info, and even cookies. For times, when neither options fixed the problem, try creating a fresh Firefox profile, which won't have any of your bookmarks, passwords, and user preferences, but might get rid of the problem. In the General panel, scroll down to the Performance section and uncheck the box labeled "Use recommended performance settings"
Uncheck another box named "Use hardware acceleration when available"
There you go. About a dozens of apparent and not-so-apparent tips should bring your Firefox to the best shape possible. And even if you don't experience many troubles with Firefox, following some tips above would help you optimize its speed and responsiveness. Best of all, you don't need a lot of third-party tool to perform a thorough checkup, and all the tools you need are easily available on Setapp.